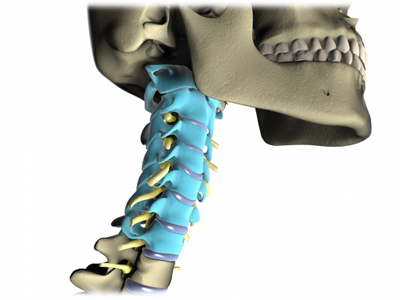 The cervical spine is the part of the spine in your neck. The spinal cord sits inside a tunnel created by the vertebrae (bones making up the spine). It is also protected by a soft layer of tissue called the dura. The epidural space is the area between the boney canal and the dura layer of the spinal cord. An epidural injection is a procedure to deliver medicine into this epidural space. The medicine may include an anesthetic that will numb the pain and a steroid that can decrease swelling and irritation. An epidural injection may be done if you have pain in your neck and upper limb that is not responding to conservative treatment, such as oral medicines and physical therapy. Damage to local joints or discs of the spine can irritate the nerves exiting the spinal cord. This can cause inflammation around the nerves, which leads to pain. The pain may be in the neck or may travel down to the shoulders and arms, and even to the hands and fingers. The injection may provide relief for a few weeks or even a couple months depending on the exact cause of pain. This procedure may help manage the pain until the injury that caused the nerve irritation has time to heal. Your doctor may begin with conservative treatment, such as rest, medicine, physical therapy, and exercise. You will be awake during this procedure. A local anesthetic will be used to numb the skin before the injection. Your doctor may also give you medicine to help you relax. You may have devices attached to help monitor your blood pressure, heart, and oxygen levels. You will be asked to lie on your stomach or side on an x-ray table or sit in a chair. The skin around the injection site will be cleansed. A local anesthetic will be given to numb the area. The doctor will inject a contrast dye. This dye will help highlight the area to guide the needle. This is done using a type of x-ray called fluoroscopy. Next, when the doctor has reached the epidural space, the steroid will be delivered. The nurse will place a small bandage over the injection site. You may be able to go home after being observed by the nurses. The injection only takes a few minutes. The entire procedure may be 30-60 minutes. There is local discomfort as the numbing medicine first goes in. But the rest of the procedure should not be painful. Once the injected anesthetic wears off, you may have some discomfort. Your doctor will assess your level of pain relief. Do not exert yourself on the first day. Talk to your doctor about any specific activity recommendations. To reduce soreness, apply ice or a cold pack to the affected area for 15-20 minutes, a few times over the first day. Wrap the ice in a towel. Do not apply it directly to your skin. Take over-the-counter pain medicine as recommended by your doctor. The soreness should go away in a couple of days. Pain may return, though, when the anesthetic wears off. It may take a few days before the steroid medicine takes full effect. Follow your doctor’s instructions on cleaning the injection site. Avoid baths, pools, or whirlpools for 48 hours after the injection. It is usually safe to shower, though. Ask your doctor when you should return to work. If you have stopped any medicines before the procedure, ask your doctor when you can resume taking these again. If you have diabetes, monitor your blood sugar levels more carefully a few weeks after an injection. The medicine that was injected may cause elevated blood sugar levels.